Ringo Starr, MBE, was born Richard Starkey on 7 July 1940, and is currently known as an Academy Award-winning English musician, singer, songwriter and actor, best known as the drummer for The Beatles. He was the last to join the "Fab Four" line up. Liverpool Daily Post, 2006 : ". . . Ringo, together with wife Barbara Bach, . . .We're vegetarians and we grow a lot of fruit and veg ourselves . . . "
In a 1995 interview, Paul McCartney said, ""We all turned out to be veggie. 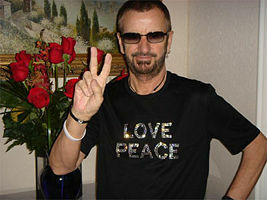 Ringo's walking around with, like, a bag of seeds, so healthy".